How can I make my slides clear and engaging? We all face a similar question along with feelings of fear or anxiety when it comes to a significant presentation at a conference or event. Finally, a solution to these troubles has been created. Meet Billboard, a product inspired by many of the best TED Talks and other prominent conferences; delivered to you in the form of a presentation template. A powerful presentation is like an effective ad. No clutter, no mess of bullet points. Just one central message per slide. The best presentations are perfectly readable and memorable. Billboard is a presentation development tool consisting of 11 content sections (such as cover, quotes, infographics, closing slides, and more), filled with 100 carefully-designed slides. 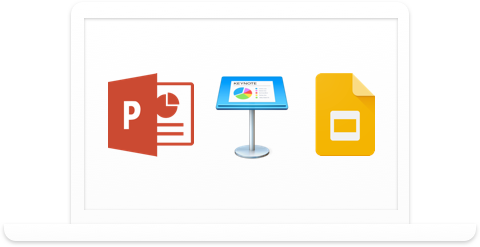 Open Billboard in PowerPoint or Keynote and fill it up with your own content. No extra skills or downloads required; just install your font and go! The template comes with 4 unique styles so you can visually communicate with your audience in most effective way. Slides created with Billboard by people just like you. The development of this template was inspired by analyzing over 1,000 TED Talks and presentations from many other prominent conferences. 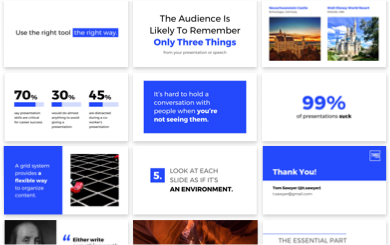 Build an inspiring and memorable presentation with 100 carefully-designed slides. The template is packed with 100 icons, social media thumbnails, essential device mockups, and a comprehensive world map. Choose one of four striking color schemes (Blue, Red, Yellow and Green) or create your own to better fit your needs. Adjust your presentation to the conference environment using a lighting background that best fits the scene! Billboard works perfectly with all two, so you can pick your favorite software. Let's be clear here. Billboard won't instantly make you a star presenter on-stage all by itself. 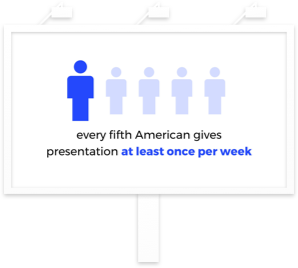 Great presentations tell a story and then use slides to complement the story. So start with the story first! And once you're happy with the content, use Billboard to create a memorable presentation worthy of your story! + Future Style Releases. Save 25%! Get a Billboard template with your own unique style for $199. Learn how this works.